Blowzabella will be running melodeon, pipes, hurdy-gurdy, song, fiddle, ensemble and dance workshops throughout the day at More Music. Blowzabella are a genuinely unique band that makes an inimitable, driving, drone-based wall-of-sound, played with a fabulous sense of melody, rhythmic expertise and sheer feeling. 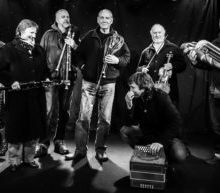 Blowzabella is made up of Andy Cutting – diatonic button accordion; Jo Freya – vocals, saxophone, clarinet; Paul James – vocals, bagpipes, saxophones; Gregory Jolivet – hurdy-gurdy; David Shepherd – violin; Barn Stradling – bass guitar; Jon Swayne – bagpipes, saxophone. For more information on the workshops or event email info@moremusic.org.uk or click here. To book tickets follow the BOOK NOW button.